What are the thickness and material of different coverslips? #1.5P 0.175±0.01 Tissue culture treated polymer cover slip with optical characteristics very similar to that of a cover glass. Recommended for applications where better cell attachment is desired. Not suitable for TIRF. Plates with large wells, such as the 12/24 well plates, that uses #1.5P coverslip may not be suitable for applications such as whole plate auto-scan, where whole plate flatness is critical. Because the film is soft and therefore is slightly curved within large wells. What are the applications each coverslip is suitable for? *For DIC imaging, using our glass top glass bottom dish, or glass bottom plates coupled with plate lid with cover glass is recommended. What are the properties and applications for dishes and plates with #1.5P coverslip? Most tissue culture dishes and plate are made from polystyrene. Polystyrene is hydrophobic by nature, it needs to be tissue culture treated (usually through a physical process using plasma) to render the surface hydrophilic to enable cell attachment. Typical cover glass has a hydrophilic surface therefore does not require tissue culture treatment to enable cell attachment. However cells ususally attach weaker to cover glass than to tissue culture treated polystyrene dishes and plates. Our experiments show that tissue culture treatment of cover glass does not improve cell attachment. #1.5P is a tissue culture treated polymer coverslip. It has optical characteristics very similar to that of a cover glass, but shows better attachment for cultured cells than cover glass. In our experience it also shows better attachment for coating media such as poly-lysine and collagen. 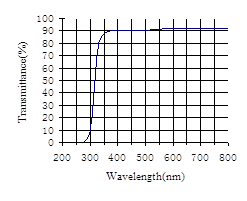 In comparison with cover glass, #1.5P has high transmittance within UV range (approximately 75% at 280nm). Therefore it is not suitable for applications where UV transparency is not desired. Because #1.5P is a soft polymer, its flatness is slightly worse than that of a rigid cover glass. This is neglegible for plates with small wells, but may become a problem when the well size gets larger. Plates with large wells, such as 12 well and 24 well plates with #1.5P coverslip, may not be suitable for applications such as whole plate auto-scan, where whole plate flatness is critical. If you are not sure you can request a free sample before purchasing. Overall, our products with #1.5P coverslips are recommended for applications where better cell attachment is desired. What are the optical properties of the cover glass ? What are optical properties of the polymer coverslip #1.5P? Transmittance (2 mm)：91.5% (400-700nm), approximately 75% at 280nm. Unlike cover glass, #1.5P is UV transparent. What are the differences between the plastic surface and glass surface for cell culture? Most plastic vessels used to culture attached cells are made from polystyrene. Since polystyrene is hydrophobic and most cultured cells can not attach to hydrophobic surface, plastic cell culture vessels are usually surface treated to introduce hydrophilic groups onto the surface to help the attachement of cultured cells. Glass surface on the other hand, does not need any pre-treatment to allow the attachment of the cultured cells. However the attachment usually is not as strong as that of surface treated polystyrene, our experience indicates that poly-lysine, collagen coating works much better on plastic than on glass. Consequently, poly-lysine or collagen coating on glass are less stable than poly-lysine or collagen coating on surface treated plastics. What kind of adhesive is used to adhere the dish and the cover glass? How can I detach the bottom glass? We use a USP class VI adhesive to adhere the dish and the cover glass. This adhesive is nontoxic, and it is resistant to water and common fixing reagents such as methanol and ethanol. This makes our glass bottom dishes and glass bottom plates ideal for long term cell culture. The bad news is that the adherence between the dish and the cover glass is so strong, that it is very difficult to detach the cover glass	from the dish. What is the harmonized tarrif code of your products?